Results can be delivered only when the right person is handling the right job. It is possible only when competencies are considered in hiring and not connections. We hear various stories in the private and public sectors that reveal the clarity required in ensuring the right set of competencies. Let’s discover this further in today’s column. The choice of connections over competencies has been a perennial issue in the local political arena. The kith and kin of those who are at the helm appear to be the favorites with regard to filling key positions. Whether we witness a change in this practice remains to be seen. As the Indian media reported, the Modi Government, in its very first order issued on the day Modi was sworn in as Prime Minister, barred ministers from handpicking “personal staff”. This was unprecedented and showed Modi’s intent to ensure that none of his ministers fostered a “hidden agenda”. No one, not even Indira Gandhi, went to this extent to keep a check on ministers from overstepping their briefs. It also brings to an end the appointment of family members as personal staff, which has been a practice with many a minister over the years. Can we say the same thing about Sri Lanka? Perhaps it is still premature. However, a significant fraction of society is looking forward to it as a vital part of exemplary governance. The word ‘canvass’ has many meanings assigned to it, according to any typical dictionary. I would go by the idea that it is a “large piece of fabric (usually canvas fabric) by means of which wind is used to propel a sailing vessel”. In other words, something that propels in giving direction and protects in guarding against outside forces. Figure 1 illustrates the components of a competency. In broad terms, we can identify three specific categories, namely knowledge, skills and behaviours. In other words, these three form the three main compartments in the competency canvass. Let’s discuss them in detail. Knowledge essentially refers to the understanding of a particular subject. It includes information acquired through experience or education. It also refers to the theoretical or practical understanding of a subject. In other words, knowledge is what is known in a particular field or in total, facts and information. Ikujiro Nonaka, a veteran researcher of knowledge management, describes two types of knowledge, namely tacit and explicit. Let’s start with the easily seen one. Explicit is also known as the coded knowledge. It is the one which is available in soft and hard forms in text books, manuals, CDs, etc. It is easily communicated and shared, as in product specifications, a scientific formula or a computer program. Tacit Knowledge is based on personal experience. It is hard to explain and therefore difficult to communicate to others. It could be a craft or profession, a particular technology or product market, or the activities of a work group or team. As tacit knowledge is within individuals, the challenge is how to capture individual-based knowledge to make it explicit and common knowledge for use across the entire organisation. We have many examples of tacit knowledge getting trapped without being properly translated. Take the case of an indigenous physician. He might touch a patient and heal. While the ‘golaya’ (student) might be taking notes of his teacher’s behavior and trying to learn, this may not be entirely successful. Why some of the ancient technologies used to construct stupas, dagobas, tanks and canals are not available now could be easily attributable to the non-transference of the tacit knowledge of our ancestors to a coded form. Even in a corporate scenario, the resignation of an experienced manager might create a dearth of knowledge unless a proper plan is in place to ensure translation of at least some of his/her tacit knowledge to his/her successor. This can be a critical knowledge challenge in order to ensure business continuity. A skill or ability refers to a natural or learned capacity to perform an act. A skill is also the learned capacity to carry out predetermined results often with the minimum outlay of time, energy or both. It was Robert Katz (1974) who classified management skills as technical, human and conceptual. Technical skills pertain to what is done and to working with things. They comprise a person’s ability to use technology to perform an organisational task. An engineer using his/her engineering expertise is one such example. Human skills refer to how something is done and to working with people. They comprise a person’s ability to work with people in the achievement of goals. An engineer using his/her persuasion skills in motivating his/her team is an example. It is essential they refer to interpersonal relations. Conceptual skills relate to why something is being done and to a person’s view of the organisation as a whole. They comprise the ability to understand the complexities of the organisation as it affects and is affected by its environment. These can be defined as the ability to co-ordinate and integrate the organisation’s diverse activities and are most important at the top of the organisational hierarchy where strategic or long-term decisions are made. Behaviour refers to a pattern of actions or conduct. This in fact is the most complex and most controversial component. Some authors tend to simplify things in calling the three components of a competency as knowledge, skills and attitude (KSA), in highlighting the behavioural aspects as the attitude. Interestingly, there is a model that combines the behavioural aspect with others. It is called the ABC of an attitude. Behaviours are typically evaluated in terms of consistent adherence to a set of behavioural standards. Builds and maintains customer satisfaction with the products and services offered by the organisation. Focuses on the customer’s business results rather than own. Seeks customer feedback and ensures needs have been fully met. Delivers products and services when and where the customer needs them. Explores options when unable to deliver a requested product or service, and pursues solutions until the customer is satisfied. Aligns the direction, products, services and performance of a business with the rest of the organisation. Integrates executive direction into every decision and consultation. Seeks to understand other programs in the department, including their services, deliverables and measures. Advocates for and positively represents other programs and services when working with customers and stakeholders. 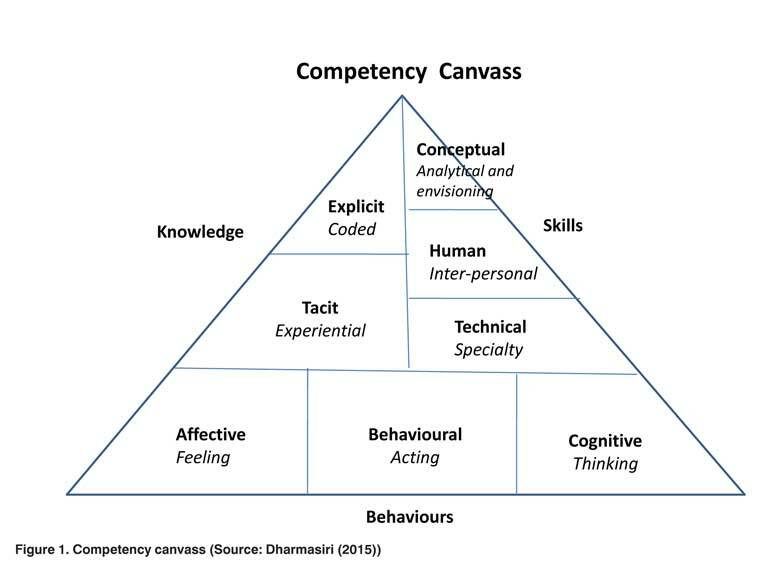 In combining all the elements and sub-elements, the competency canvass can be depicted as shown in Figure 1. 1.In developing job descriptions with clear identification of knowledge, skills and behavioural requirements. 2.In recruitment and selection where a proper assessment of the candidate is required. 3.In employee performance management, where objective evaluation is essential. 4.In training and development, where identified competency gaps should be filled. 5.In career and succession planning, where required competencies at the next level should be identified. 6.In compensation, where due recognition should be involved with competency-based pay. One may think that it is all in the HR domain. Yet, the fact remains that every functional manager has to work with people and hence their competencies are of high importance. A competency canvass assists us in clearly identifying the components of a competency with the associated components. Sri Lankan managers have to be more objective in clearly identifying the required competencies of their team members or it will be a case of rushing to decisions on people based on mere opinions. Sri Lankan organisations can enhance their hiring professionalism by way of ensuring the preference of competencies over connections. It will pave the way for not only higher organisational performance but also for better employee satisfaction. Even at the national level, the key challenge of picking the right person to handle the right job can be meaningfully handled by adhering to some of the fundamentals of Human Resource Management. Then, competencies should be more significant than connections.